Nearly 100% segregation and separate collection is now happening through the BBMP in the area covering 850 individual homes in Chunchaghatta. This transformation has been possible in just three weeks! This write up is intended to share the story of how this happened. When Bhaskar and I decided to initiate action towards getting residents to segregate waste in one part of Ward No. 195, we did not anticipate the amount of time it would take, the methods which would work best or the challenges that lay in store for us. We just got started with a madness to do whatever it takes to understand the issue and make it work! And what an amazing experience it has been! 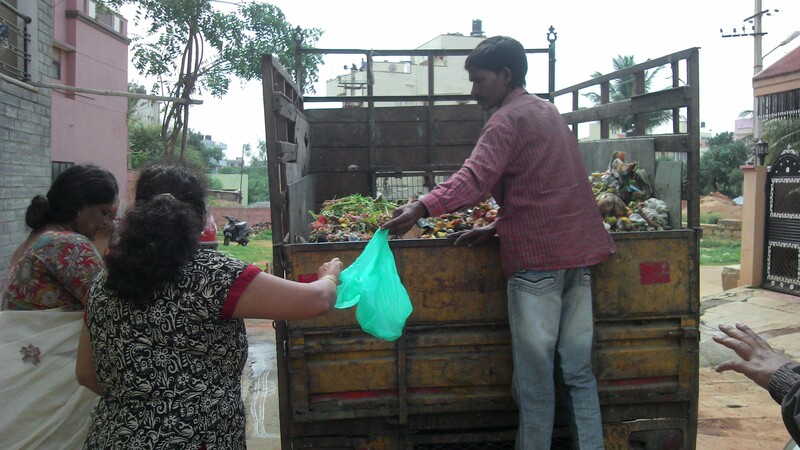 This write up covers our story – that of Bhaskar and me who went on our garbage trail each day, and that of Nagaraj and Ramana, whose auto we followed religiously each morning. And the story of the friendship we developed in this short span of time. We decided right at the beginning that we will engage with grass root workers, not by instructing them but by planning and working with them. 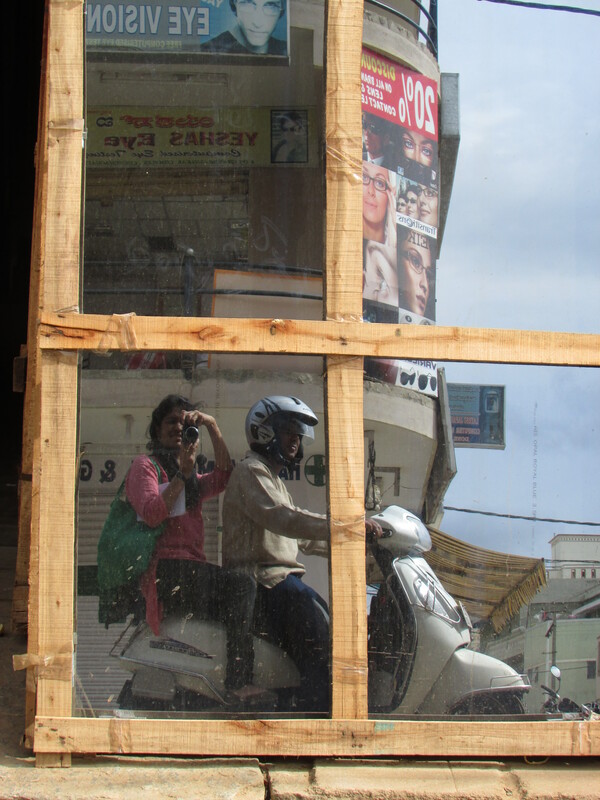 We picked Nagaraj’s auto at random. He didn’t seem to pay us much attention then and probably thought we’d leave in a day or two. So, he would make us come by 6 am and himself turn up by 7 am! He rarely spoke to us, avoided us much and finally, ignored our calls when he would take random days off work. Little did he know that when Bhaskar and I put our mind to something, absolutely nothing can shake our determination! We quietly followed him around on our scooter the first week and interacted with residents to understand what their concerns were. The residents repeatedly said one thing: “If the garbage pickup is regular, we don’t mind segregating.” And therefore, they did not segregate. Nagaraj had to say this: “The only problem is the jumping problem (we soon realised, he meant ‘dumping’ problem). It is not in my hands to control that. And if I can’t unload my garbage, I simply cannot turn up the next day for pickup.” And so, segregating waste was far from his mind. One fine morning, Nagaraj suddenly told us “Lets start informing the residents to start segregation.” And just like that, it began. We had decided that we will not initiate it ourselves and will only go by what Nagaraj feels. We did not want to create dependence on ourselves but instead ensure ownership by those who are meant to do this work. So when Nagaraj felt that he was ready, we made ourselves ready. When we started to ask residents to begin segregation, most of them agreed. But some yelled back, especially at Nagaraj, blaming him for irregular pickups, since he was the driver of the auto and the person who collected their garbage. That’s when we stepped in and spoke on his behalf, defended him and made residents understand what the real issue was. During one casual conversation, Nagaraj told us how nobody else had done that before – that the area supervisor and health inspector would never take up for him and instead, he was always on the receiving end of people’s frustration. Perhaps, it was this; perhaps, just the fact that we turned up each morning, come rain or shine, and were stupidly excited to follow his garbage auto. 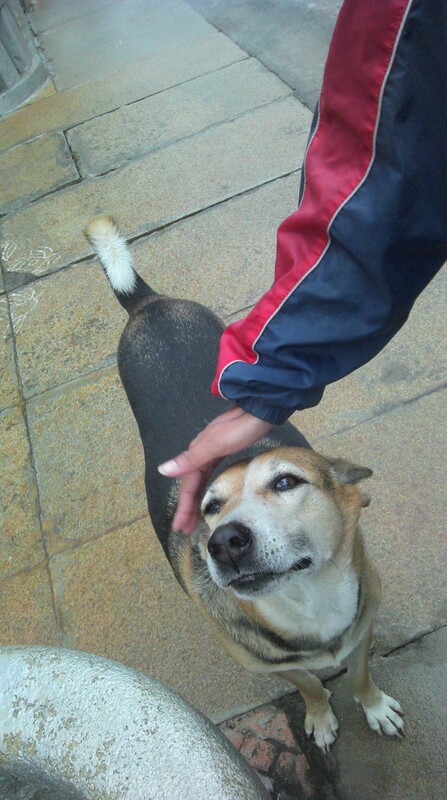 But Nagaraj started to loosen up around us and things became interesting. Bhaskar and Nagaraj chatting about Telugu movies during a break! If the work extended longer, especially on a Sunday, he would quietly buy us a banana or some juice, so we don’t feel tired. When I complained that he shouldn’t keep spending for us, he allowed me to buy him a cigarette once or twice! Ramana, on the other hand, mostly remained quiet. 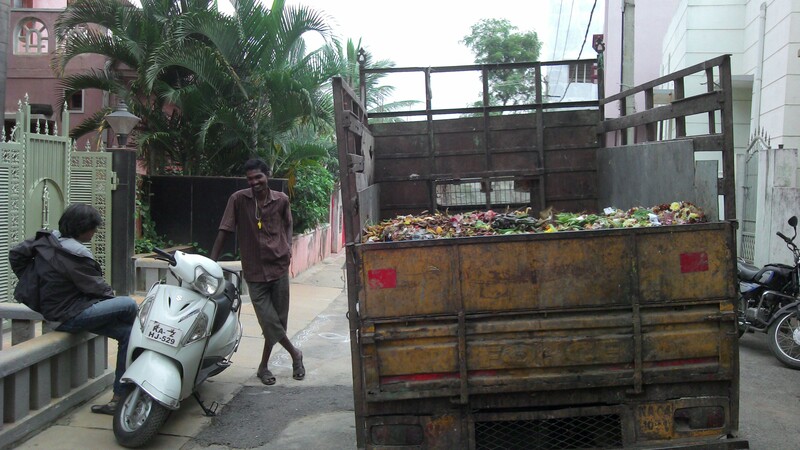 His job was to segregate the mixed waste that people dumped in the auto. As a result, he always wore the worst clothes with pants cut at the knee and almost torn chappals. During the garbage rounds, he would remain continuously bent, lost behind the mountain of garbage being dumped, segregating the mixed waste. By the end of each working day, he would be drenched in garbage, head to toe. It has been a week now that Ramana wears a neat pair of jeans, and a clean shirt. His hair is neatly combed and his back is straight. 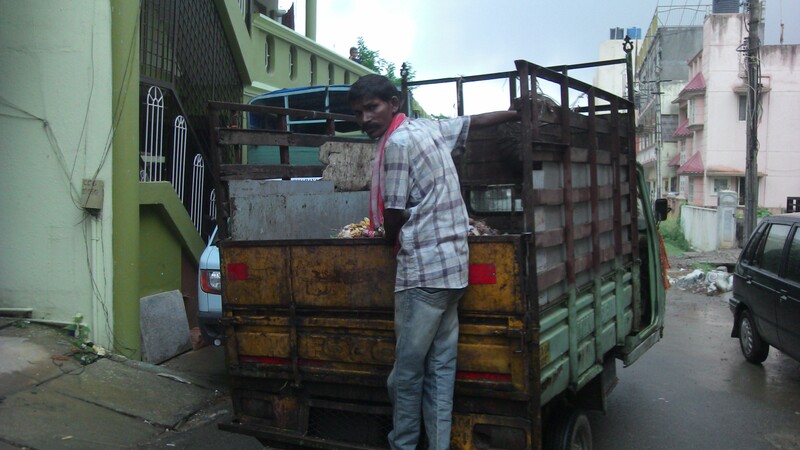 The reason – people are segregating at source, and this man does not have to dig into their garbage any more. 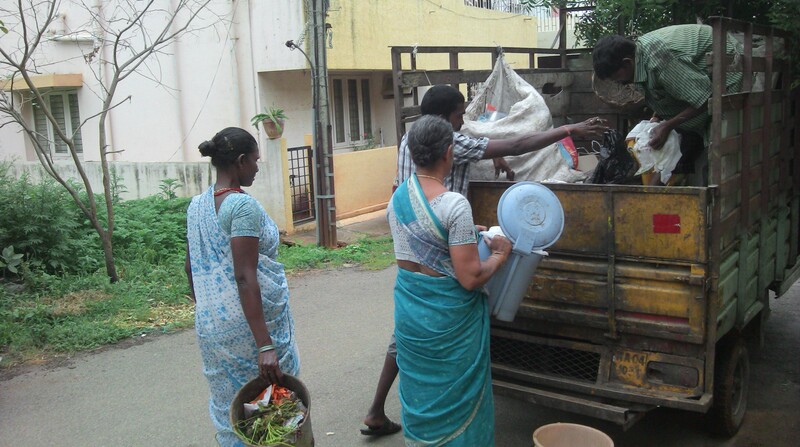 In the beginning when we started to collect segregated waste, Bhaskar, Nagaraj, Ramana and I would run in four different directions on each street – informing households to segregate, preventing residents from dumping unsegregated waste in the auto, attending to residents who complain and avoiding the barking dogs! However, things improved much sooner than we expected (barking dog included!). With just about two rounds of this crazy running around, things started to fall in place. Most residents at least made an attempt to segregate as they were not really sure what constituted wet and dry waste. It became easier to show them what segregation means when they came to throw it in the auto because that’s when they are willing to apply their mind to their garbage. So with each resident, after Bhaskar and I did an initial inspection, Ramana would tear the plastic cover in which they handed over garbage and return any dry waste (cover included) that was mixed with the wet waste. This way, each resident became conscious of how to segregate. We did this every morning for 2 weeks which followed one week of only informing residents and giving them time to segregate. An important aspect which worked in our favour was my presence, being a woman. 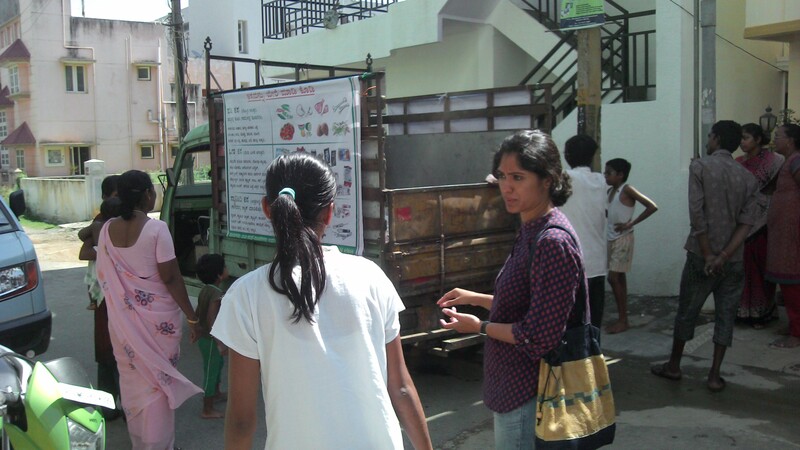 Sanitary napkins and diapers rarely get disposed correctly, and women would never ask Nagaraj or Ramana about it. These men would quietly crib about having to handle it. As I started showing up each morning, women would call me aside and ask me what to do with their Sanitary waste. And later, I started telling them upfront to wrap it in a newspaper and hand it over separately. This was a relief to all involved. As nearly 100% segregation is now happening, we are thrilled at the auto being less than half full each day! 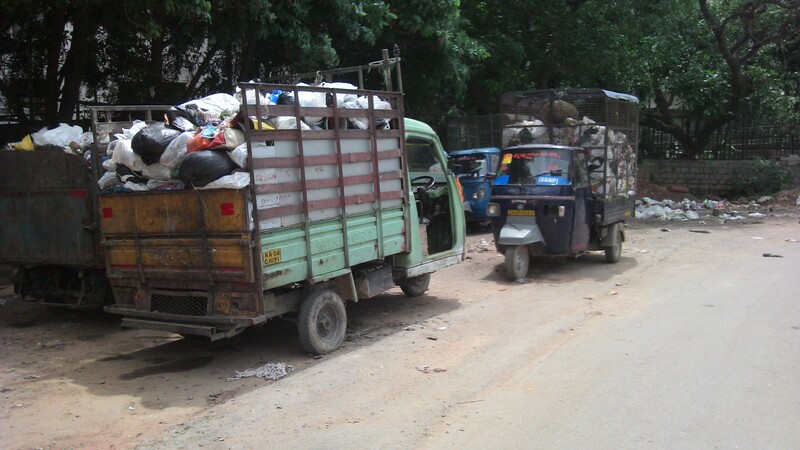 Gone are the days when the auto would be loaded after just 4 streets with all kinds of mixed waste. I never thought I’d say this, but I have come to love the sight of pure wet waste which has no plastic mixed in it. Of course, when I expressed this to Nagaraj, he pulled my leg saying that I should take it home if I loved it so much! Auto filled with only wet waste, following the day’s collection. Less than half the auto gets covered. On weekdays when we collect only wet waste. We begin work at 7 am and end by around 11 am, covering alternate streets each day. 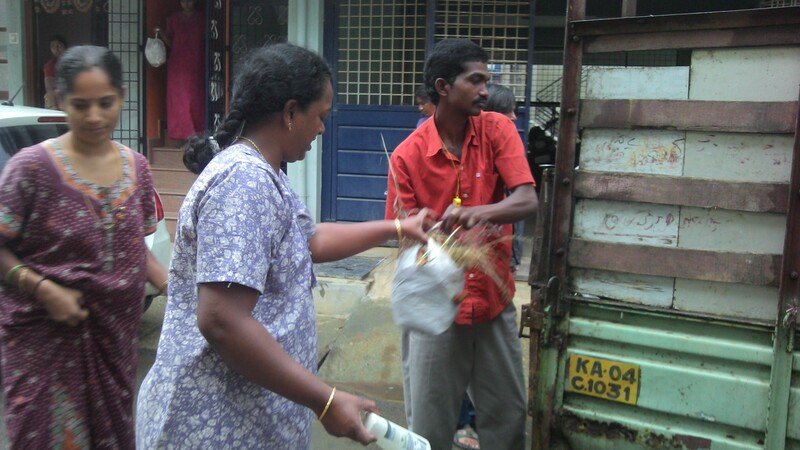 On Sundays when we collect only dry waste from all the streets, work begins at 6.30 am and extends to 12.30 pm. This is the easy part. 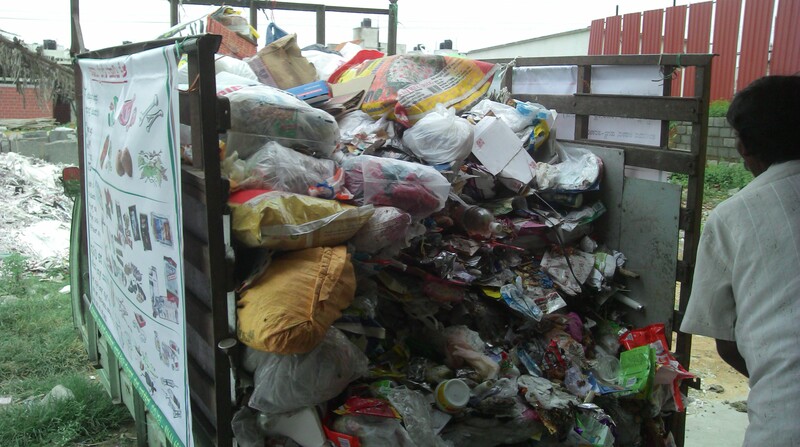 The difficult part was finding suitable options for composting the wet waste, recycling the dry waste and making a plan for clearing the garbage on ground (blackspots). 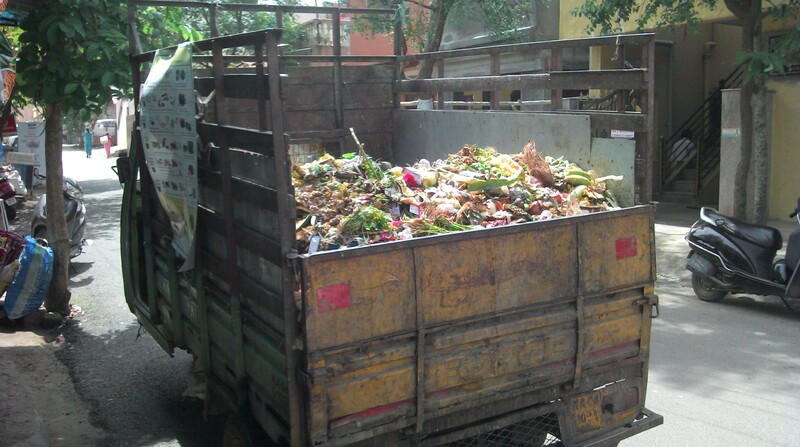 With no movement from the BBMP to contact KCDC for composting despite our many efforts, we had to look elsewhere. 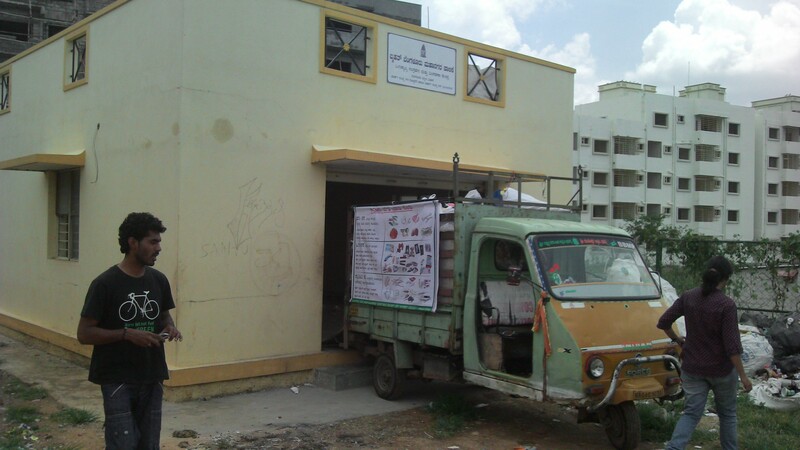 Even the option of the NGO we found in Avalahalli didn’t work as BBMP in their excitement started to send 3 autos (2 of which did not segregate) while the composting unit could only handle the load from 1 auto. So, for the most part, despite segregation, we continued to send the waste to the landfill. On a Sunday, we decided to send the dry waste to the Dry Waste Collection Centre (DWCC) at Gottigere, which is officially the centre for recycling the dry waste from our ward. Once we got there, we met with the coordinators from Radio Active who manage the centre and were quite thrilled to find that this centre has room for composting as well! Why the BBMP never mentioned this to us, we do not know, but now we are finally beginning to see how we can complete the loop in the right manner. 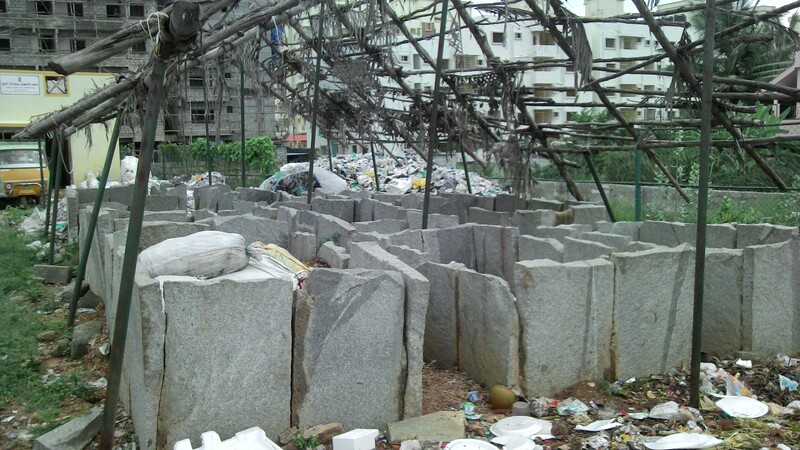 As for clearing the garbage on ground, we (Nagaraj and us) plan to keep aside two days a week only for this, so that it does not get mixed with the segregated waste. This also means extended work hours on other days as we will now have to cover all houses on one day for wet waste, instead of alternate days covering half the total number of houses. Hopefully, things will ease out after a while and the people who create the blackspots will start handing over their waste to BBMP, instead of dumping it on the streets. We are quite amazed at the ownership and dedication of Nagaraj and Ramana and how they are stretching themselves to make this happen, without any push from our end and certainly without any incentives. These days, they reach by 6 am and we get there by 7 am. Nagaraj is now telling us that he needs our help for just about another week and after that we should start shadowing another auto. He might even help us initiate this in other parts of the ward. Talk about empowerment! Wow, this is such a fantastic effort from you guys. I cannot even imagine the dedication it would have taken. Kudos!